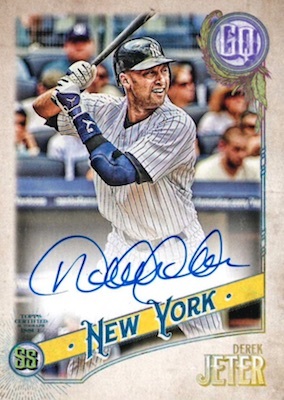 Still tinkering, 2018 Topps Gypsy Queen Baseball updates the primary design but the hobby box output remains the same with two autographs and one topper. 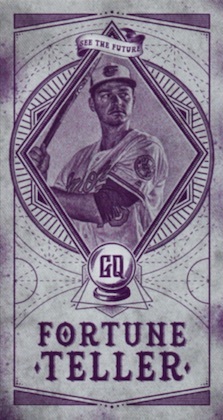 Although the faded borders from the 2017 GQ set return, the differences for 2018 Topps Gypsy Queen MLB are immediately evident. In addition, several new inserts and variations enter the lineup. Feeling both modern and old school at the same time, the base set in 2018 Topps Gypsy Queen Baseball takes advantage of the corners for the design. This involves a thin banner that is diagonal across the GQ logo at the bottom, and a position logo in the opposite corner at the top. 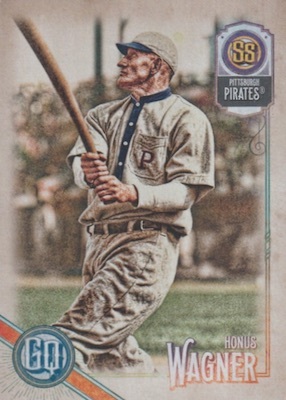 Parallels include numbered versions like Indigo, Black and White (#/50; hobby), Red (#/10) and Black (1/1), as well as the limited Missing Team Name parallel. 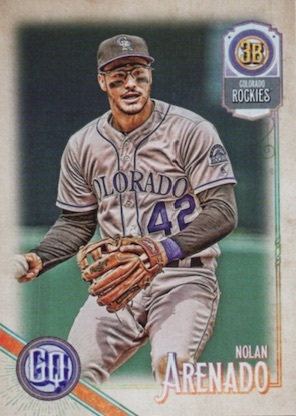 "Unannounced parallels and hidden gems" are also in the mix, while the Base SP cards are only for the former stars. Among the other short prints, the 2018 Topps Gypsy Queen Baseball checklist includes Jackie Robinson Day Variations with images of players honoring the former great by wearing his legendary #42 jersey. These have one-of-one Black parallels and hard-signed Autograph versions. Back in action, Capless Image Variation short prints again highlight top names without their hats. 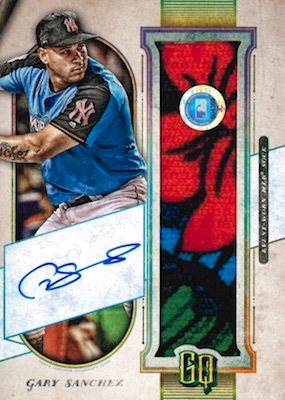 Putting pen to card, the 2018 Topps Gypsy Queen autographs appeal to the hobby preference for on-card signatures. The main GQ Autograph set adds numbered Indigo, Black and White (hobby) and Black (1/1) editions. Plus, collectors can be on the lookout for surprise autograph variations. New this year, key rookies meet a shrink ray for the Mini Rookie Autographs. The hard-signed miniatures are numbered. Also debuting in 2018, the Pull-Up Sock Autographed Relics insert offers rare cards with sock pieces used in the Home Run Derby. Other auto relics include Autograph Garments, the tri-fold Autograph Patch Book, and the Base Around the League Autograph Relic cards, which contain a game-used base piece from the 2017 Opening Day games. 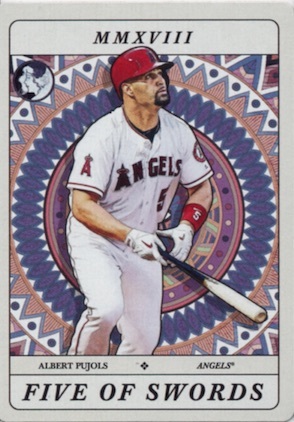 Another new addition to 2018 Topps Gypsy Queen, Tarot of the Diamond presents art-based interpretations of top stars. Trying to predict the future, the mini Fortune Teller cards contain MLB accomplishments that could happen. Both inserts are enhanced with Indigo and Black (1/1) parallels, while Fortune Tellers has an Autograph option. After making a strong showing last year, the hobby-only Glassworks toppers return with more oversized Chrome cards to collect. Falling one per box, there are also Indigo, Red (#/10) and Black (1/1) parallels, along with Autographs. PARALLEL CARDS: Green (Retail), Purple (Mega Blaster), Missing Nameplate, Indigo #/250, GQ Logo Swap, Bazooka Back, Black & White #/50 (Hobby), Red #/10, Black 1/1. PARALLEL CARDS: Missing Nameplate, GQ Logo Swap, Bazooka Back, Black 1/1. 1:121 packs. Full guide and gallery. PARALLEL CARDS: GQ Logo Swap, Black 1/1. 1:106 packs.Full guide and gallery. PARALLEL CARDS: Black & White #/42, Black 1/1. 1:843 packs. Full guide and gallery. 52 cards. 1:19 packs. Shop GQ autographs on eBay. PARALLEL CARDS: Indigo #/150, GQ Logo Swap #/99, Black & White #/50 (Hobby), Gum Back #/25, Black 1/1. 12 cards. 1:809 packs. Serial numbered #/99. PARALLEL CARDS: Black & White #/50, Black 1/1. 18 cards. 1:921 packs. Serial numbered. 11 cards. 1:2,877 packs. Serial numbered. 8 cards. 1:4,015 packs. Serial numbered. 3 cards. 1:7,920 packs. Serial numbered. PARALLEL CARDS: Indigo #/250, Green #/99 (Retail), Black 1/1. 25 cards. 1 per Hobby box. PARALLEL CARDS: Indigo #/150, Red #/25, Black 1/1. 9 cards. Serial numbered. Hobby only. 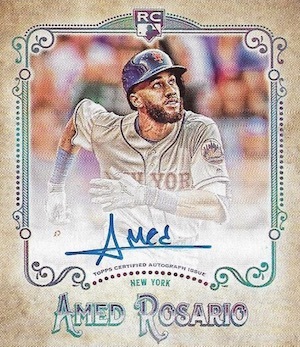 See the 2018 Topps Gypsy Queen Baseball checklist spreadsheet. Good: On-card autographs; GlassWorks toppers are still very impressive; several quality designs. Bad: Too many parallel/variation gimmicks; feels a little light in the insert department. 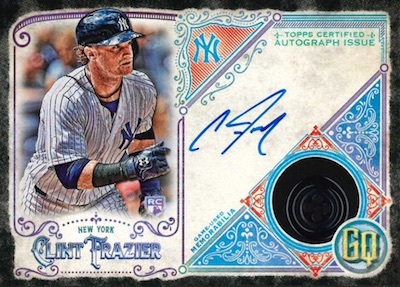 The Bottom Line: Given the two autographs per box and sizable (but not impossible) base set, 2018 Topps Gypsy Queen Baseball is a rare release that can appeal to both hit and set collectors, at least to an extent. Higher box prices make the main autograph checklist a little tougher to appreciate but GQ is solid overall. 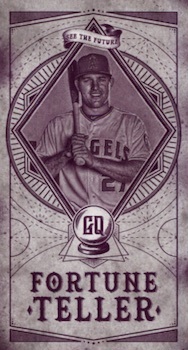 As I sit down and examine it, I really like the base design in 2018 Topps Gypsy Queen. It is not a very big change from 2017, but I think it is a little cleaner and less crowded, especially at the bottom of the card. I do feel the position and team box at the top is awkward and made too much of a focal point. Another standout for me is the GlassWorks insert. Even though they are not new, these are some awesome toppers and the card stock is extra sturdy this year. The sizing makes it a little harder to figure out how to store it but these remain a winner in my book. I also enjoy the main autograph design with the team nameplate that features a little pop of color. These look great and the on-card signatures are always a welcome sight. From there, it's a lot of filler to me. The Tarot inserts are interesting, but I would much rather have a few more creative inserts than the glut of parallels and variations. 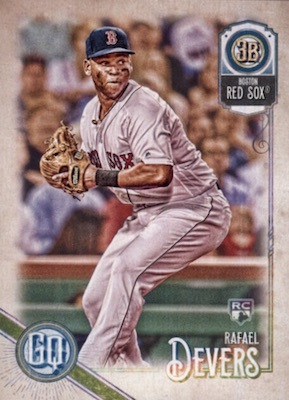 Also, if Topps wants to go the themed route with variations (i.e. capless, Jackie Robinson Day), they really need to tighten up the image selection. Multiple instances of this caused confusion for collectors when it was just a base card. And I really can't understand the planned error that displays the wrong team. With 300 base cards, the 2018 Topps Gypsy Queen set is tough but still manageable. Sure, the 20 short prints make for a much more intensive build, but collectors can decide for themselves how to proceed and it's not an impossible task if you are patient. Whenever you get two on-card autographs in a box, you know the checklist has to be filled out with some less desirable names. On paper, there are indeed some big possibilities, like Jeter, Bryant, Trout, Ohtani, and Hoskins, to name a few. But these base autograph cards aren't numbered and it is better to prepare yourself for a more obscure or low-value player. When you break it down, 2018 Topps Gypsy Queen Baseball is a pretty basic set, but it does seem to have a larger number of very tough hits. Although you are unlikely to come across one, some big-time cards are still in play. Just like Judge in 2017, Ohtani has pushed sealed box prices much higher. 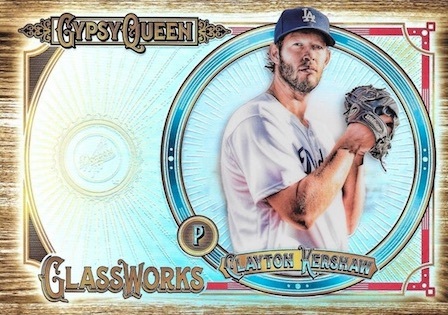 For 2018 Topps Gypsy Queen Baseball, that makes the box value less likely to deliver but is the alternative with no in-demand rookie and lower prices better? Nevertheless, the average box of GQ will have a difficult time justifying the $155-170 price tag (at the time of this review). Still, anything Ohtani helps the return for each box, and a rare parallel or variation can really turn the tables in your favor. Plus, the bigger autograph names, as well as the booklets and other cards with long odds, offer some hope for a nice score, however unlikely. 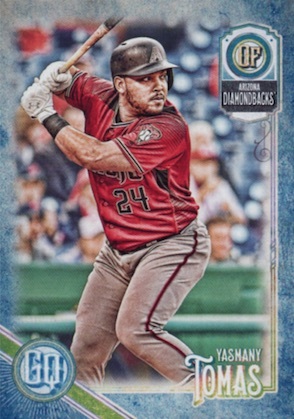 My experience with 2018 Topps Gypsy Queen Baseball is one of many peaks and valleys. To me, that's a good thing because some positive changes can really make GQ a winner. In its current form, the things I like outweigh the negatives. I understand you have to vary the look of the set but it looks like the design coloring is moving very much away from the original aspect. Really disappointed. The main reason why I would buy a bunch of boxes of these was the old style and feel. I agree with the two above posters. I will most likely skip these this year. A lot of products coming out too soon. Lineups, free agency, trades aren’t over yet. Be nice to see new players in our teams colours for this season. It’s getting pretty slack at topps. It’s all in the detail. Too many products. Too many bad products. UGLY and gosh Topps, I guess you really don’t want the Detroit fan market. ZERO inserts for Tigers, I guess the base cards were just fillers. Nobody cares about the Detroit Tigers. Stop your whining. Every product the same story. This product is terrible no Tigers. Geez you are almost as bad as Tanner peddling for Jose Canseco cards. I have and idea for you. Stop buying cards. Better yet switch to Panini. But nobody cares that your precious Tigers aren’t in a set enough. Got away from beginning too much ! Also TIGERS do have Big following ! Yes they are lousy right now . This is how ASTRO”S were NOT very long agao. They also had very few cards in any Baseball sets . Now look at them . However they should realize that just because they have small market ,Does not mean that there is not a good size following. I like the new more colorful look. Does not seem to be an Acuna in the set but otherwise some good hits. Looking forward to seeing that Syndergaard auto patch book card. Long time reader, first time reviewer. 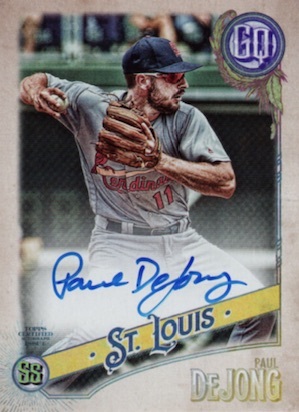 I am only making a review because I purchase one case of cards a year and it is always Gypsy Queen. I was worried about this set after all the reviews. Now that I have my case and have opened a few boxes; in my opinion, this is a beautiful set. Bought 2 Hobby Boxes today and completed the base set with around 40 doubles..not bad..
Hi. My son just pulled a rookie auto, full size, with a wood back–#ed /24. Am I missing these above or are they one of the unmentionedables that we all figure out along the way? It has the card number of the regualr auto, but the particular type isn’t listed–and it’s a Topps Chewing Gum back. Anyone else found one of these yet? What is the exact measurement of the Glass Works cards? Seth, sounds like you should switch to another hobby since you get so tore up about another collector commenting about the lack of inserts for his boyz. At least Tanner can call himself a true fan/collector. He comments about the products, and just happens to let others know that he’s looking for Canseco cards. I’m sure you can find someone that would find your comments amusing elsewhere, maybe stamp collecting. Just hope your not the same Seth Lugo that pitches for the Mets. Another lousy product with prices jacked because some lousy Japanese Lame Ruth is the new pitcher to get hooked on McDonalds Big Macs. The one and only case I buy all year. Other years I loved the product. This one was a complete disappointment. No extra hits in with it. Just a bunch of junk autos not worth much. Broke two boxes, three autos were players only their mommas would know. Hit one of the super rare books of Phillips and he gets sent to the minors. Bummer, Come on Topps if you have hit that rare the players should be stars, not spares. You are forewarned. Same old, same old garbage as last year and the year before and the year before and the year before. Topps has saturated the market with gimmicks and garbage to the point where it is no longer fun to buy. Who cares about pointless insert sets and parallels? It’s all smoke and mirrors. Just do the base set and decent autographs and be done with it. Almost all your products are a complete waste of money. Yea, I bought two boxes. Nowhere near a base set either. Why would I spend $300 or more to build a base set that sells for under $30? Why, Topps? I’m disappointed with this years set. I like to put together sets myself so imagine my disappointment when after purchasing 4 hobby boxes I’ve only compleatef approx. 75% of the base set! Topps could do a way better job,IDK maybe my boxes were filled on a Monday? Just simply not great designs. Card fronts seem crowded and doesn’t have a real reason for being. Fortune teller inserts ? Tarot card inserts ? Where is the tie in with baseball – insert gimmicks just for the sake of inserts is not what fans want. 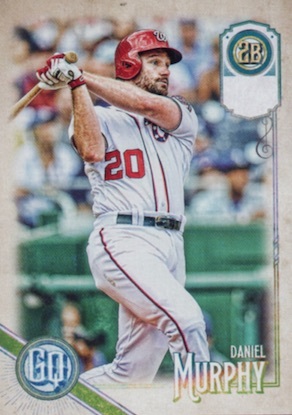 Come on Topps you can do better ……..and I think you have to if you’re going to maintain the hobby. Take all the production costs from sets like this and put the resources into making Heritage, Topps base and a few high end sets great! You built the hobby – now it’s time to rebuild it. The autos are on card and look great. so far that looks great espeically the Indigo. A great “set” product, I purchased the entire set (300 cards) no short prints, for about the price of a blaster box. The Ohtani RC is Nice!!!! I knew what I was buying and for that it was excellent. My question here is, has anyone come across a of the booklet patch autos numbered of #/10? Or see any Mike Trout booklets? I pulled a Mike Trout booklet but it’s colored red instead of blue and is number 01/10. All of the other booklets for this year are either blue #/20 or black 1/1. Dodge Slugger, the tie-in is with the name of the set, Gypsy Queen. Roma used tarot cards to read fortunes and and are commonly used as the stereotypical fortune teller. Enhanced pictures, live action, great card stock and all good players. Ohtani drove up the natural price of these boxes but a great overall value. If you enjoy collecting and building sets then you can’t miss with this product. 2 boxes and I got a complete base set. No great autos but they are at least on card. This is the best looking set topps will have to offer. If however,you are in the hobby to break boxes, ignore the actual cards and sell on eBay this probably isn’t the product for you. Only gripe is the small rate that the sub sets fly. It wouldn’t kill the set to have a few less variations overall (like missing nameplates) and kick up the subset inserts. This is after all a set Builder’s product. Got a strange Jacob deGrom autograph numbered to 45. He is wearing the Jackie Robinson Day number. The circle in the upper right where the GQ Logo goes is empty except for a weird hazy pattern. Ideas? Error? Unlisted variation? Parallel? I find no such card in the checklist. It’s the Jackie Robinson Day variation autograph. Base versions are 1:535 Hobby packs. Bought $100 on retail and got 1 auto and 5 variations. Not bad. Nice on card auto. Would have been pissed if bought hobby. This seems like a set builder rather than hit filled product. Which works for me. Oddly did better in blasters than the jumbo retail box. Love, love, love the cards. Colors look great, player selection is great. 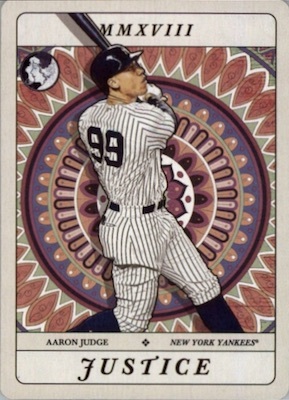 Cards are hip and upbeat Allen & Ginter has been getting boring (design wise) so this is a welcome change. High numbers give you a challenge and the auto selection is also a hit for me! I love Gypsy Queen and this years was great!!!! The Banner Auto’s really stand out. The base cards themselves are aesthetically pleasing to the eye. Agreed with Stewart above – the best looking Topps set. Not sure, Patrick. Perhaps someone else can provide the toploader size needed. Bought a Jumbo Retail Box(10 Packs & 2 Bonus Packs) of these cards from eBay. Pulled a card not listed in the checklist. It’s an auto of Eric Thames of the Brewers. On the back it’s his base card #118 listed but it’s an auto so it should be in the 2018 Topps Gypsy Queen Auto section shouldn’t it? Doesn’t have the GQA-?? designation like the autos are listed so what exactly is this type of autograph card? Did Topps just miss putting this card in the Auto section of the checklist? I wonder though because it’s just his base card #118 on the back & not like the rest of the autos are listed with the GQA-**. Any idea Trey? Thanks. Your guess is as good as ours. Could be exclusive to retail or it just could be a late addition that was omitted from the final checklist. Forgot to mention that the Eric Thames Auto card is numbered /99 on the back so it would fall into the GQ Logo Swap category but there’s a blank logo at the top right & 1B at the bottom left. So, there is a Logo Swap but what’s up with the blank logo where GQ should be located at the top right? Hello again Trey. Emailed Topps about the Eric Thames Auto Card I pulled out of the Gypsy Queen Box. I had to send them a photo of the card so they could look into this. They messaged me back on Friday to tell me this was definitely an error card. The missing GQ Logo for the Swap wasn’t there & the /99 was the correct numbering to match the card but what makes this a rare error card is the fact the GQ Logo was blank at the Swap position on the card. They know of no other cards from this years 2018 Gypsy Queen release that had such an error with the missing Log Swap. So, this makes this card worth way more than what it books for. It would be like pulling a 1/1 card basically. I’m going to put the card on eBay soon to see what I can get out of it. The Topps customer service rep said the value of the card would be at least doubled of what the regular card books for & probably even close to triple the value because it’s like a 1/1 pull. Thanks. 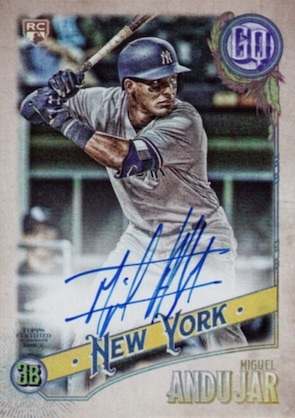 Hi, one thing I don’t see on here for your ‘Autograph Section’: I got a Manny Machado Auto with a Jackie Robinson number and missing GQ logo, #/40. It’s a base variation parallel so it’s listed under the base variations near the top of the checklist. A mini painting in your hand. Pure Art. Cards Look nice, but the Card number is waaaaaay too small. For set builders without teenage eyes, this is a struggle for this set. Perhaps its only me. I need to put on the glasses and a magnify glass.